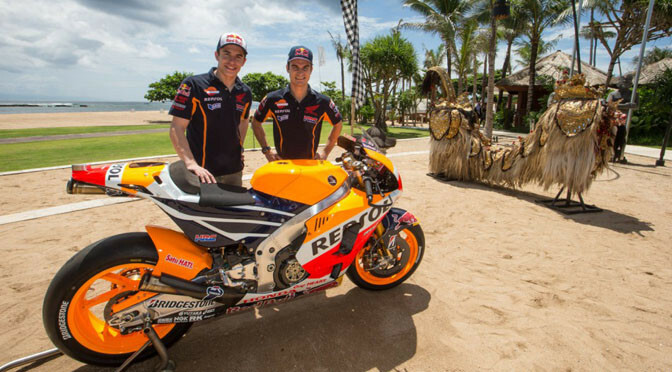 Repsol Honda’s World Champion Marc Marquez and teammate Dani Pedrosa revealed their new look 2015 race machines. 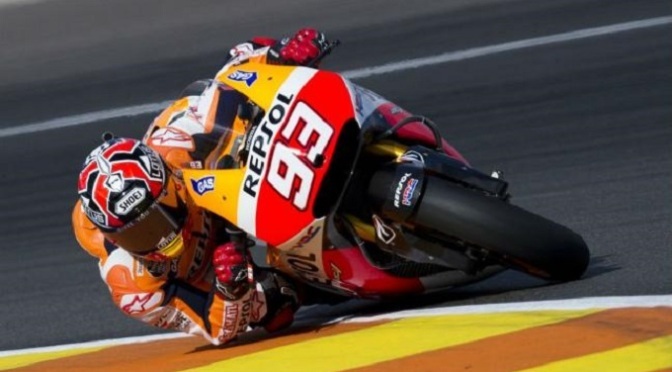 The Repsol Honda Team enjoyed an incredible 2014 season winning Honda’s third Triple Crown in four years (Rider, Constructor and Team titles) and second in succession. 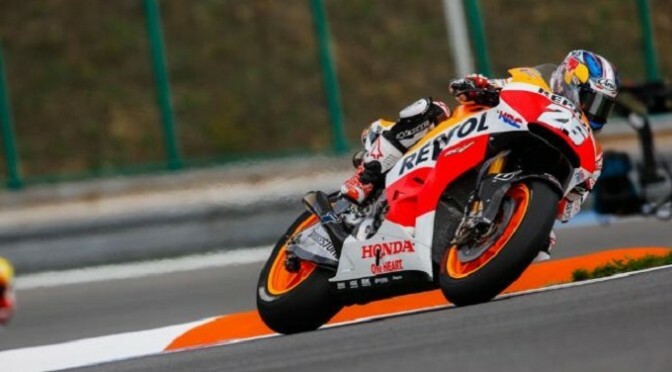 Honda continue their partnership with Repsol –after celebrating their 20th anniversary last season– and remains the longest running sponsor-factory agreement of its kind in the history of the motorcycle World Championship. 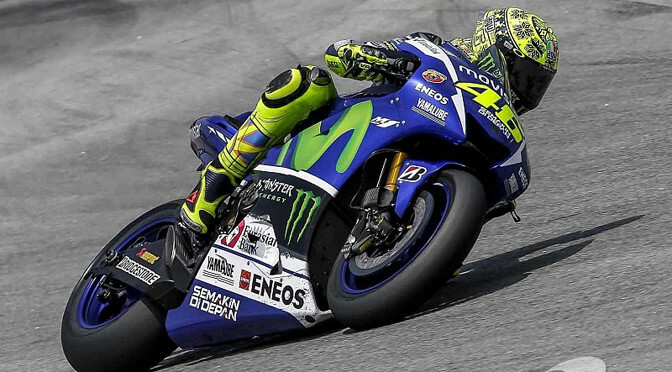 Valentino Rossi won his first MotoGP in 15 months with victory at his home track in San Marino. The Yamaha rider finished ahead of team-mate Jorge Lorenzo with Honda’s Dani Pedrosa in third. Championship leader Marc Marquez suffered an early crash and finished down the field in 15th. His overall lead was reduced to 74 points from 89. Rossi’s win at Misano was the Italian’s 81st career victory and took his MotoGP points total beyond 5,000. British riders Bradley Smith and Cal Crutchlow finished seventh and ninth respectively. The Misano circuit is located near nine-times world champion Rossi’s home town of Tavullia. His last win came at Assen in the Netherlands in June last year and the victory saw an end to Honda’s 100% winning record this season. “It’s a really great win and with Marquez in such amazing form it’s not like it happens often,” said Rossi. Rossi, 35, had qualified third on the grid, behind Spain’s Lorenzo and Italy’s Andrea Iannone, with Marquez starting from the second row for the first time this season as he looked for his 12th win in 13 races. Marquez and Rossi battled from the start, until the young Spaniard fell on lap 10. He lost control of his bike with 19 laps to go with the machine slipping out from beneath him under braking. 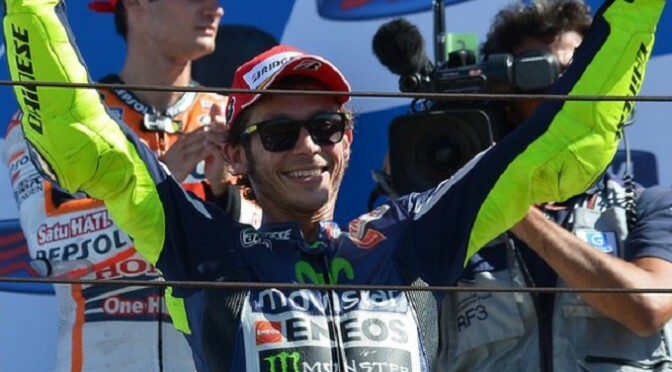 “Winning was the main aim of the season and I did,” Rossi added. “I knew I could do it and I continued to push and believe in it always, regardless of everything. The next race is in Aragon, Spain, on 28 September. In the Brno MotoGP race Dani Pedrosa won for the first time since Malaysia last year. 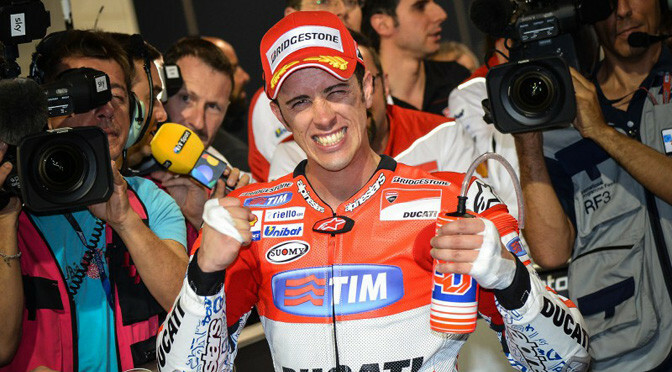 He ended the winning streak of Marc Marquez, with Jorge Lorenzo and Valentino Rossi second and third, whilst Marquez came home just off the podium. From fifth on the grid Pedrosa returned to his best form to blast through the pack and eventually take victory by 0.410s from Lorenzo in front of more than 138,000 fans. For Lorenzo it was his third successive podium result and he also produced a great ride, having started in sixth on the grid. Rossi got his seventh rostrum result of 2014 in his 245th premier class race as he equaled the all time appearance record in the top class, pulling level with Alex Barros on that front. With Marquez finishing fourth it is the first time this year that he did not win the race and this is the first time he has finished a MotoGPâ„¢ race off the podium. Marquez is of course still in a commanding position in the standings with a 77 point lead. Marquez lost out in a midrace battle for third with Rossi, having earlier had a close fight with Andrea Iannone (Pramac Racing) in the opening laps â€“ with the two former Moto2â„¢ rivals clashing on two occasions. 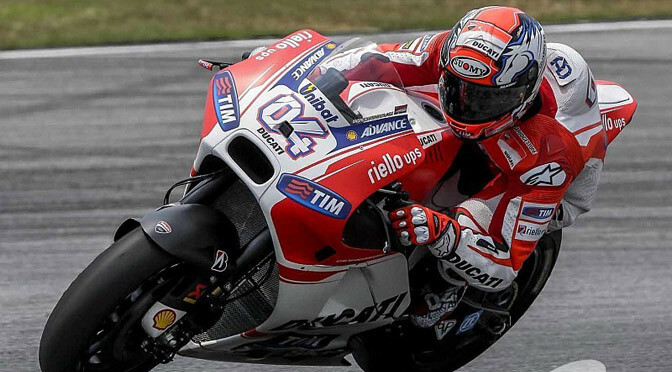 Iannone would later get the better of Andrea Dovizioso (Ducati Team) for fifth in the final stages. The top ten was completed by Stefan Bradl (LCR Honda MotoGP), Aleix Espargaro (NGM Forward Racing), Bradley Smith (Monster Yamaha Tech3) and Alvaro Bautista (GO&FUN Honda Gresini). 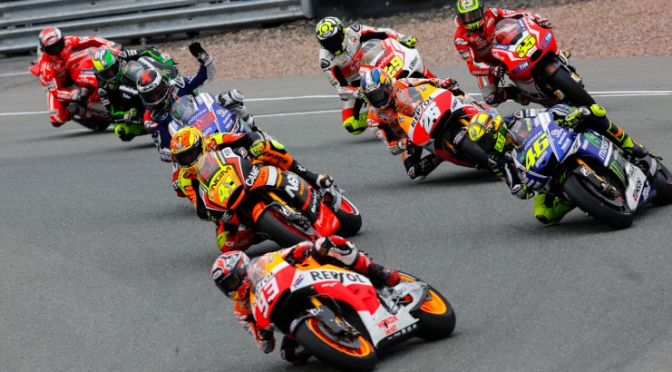 At the eni Motorrad Grand Prix Deutschland Marc Marquez made it nine wins from nine races. Rain just moments before the race start had riders switching to their wet bikes. However, the downpour was brief and 14 riders, including Marquez and Pedrosa, opted to switch to their dry bikes at the end of the final Warm Up lap and start from pitlane. Stefan Bradl (LCR Honda) switched to slick tyres on the grid and had an early lead but both Repsol Honda riders quickly caught up. Marquez and Pedrosa passed the German and had their own battle throughout the race. 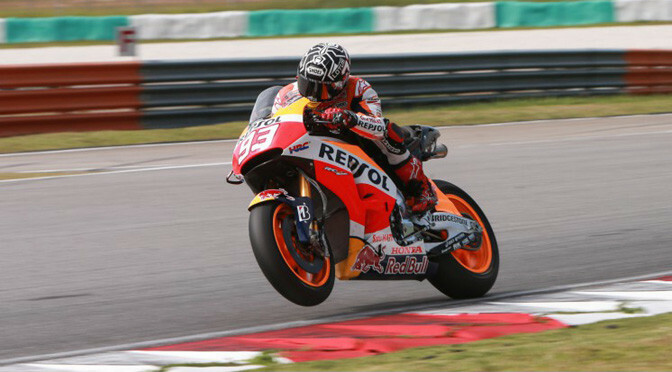 Championship leader Marquez set several fastest laps with Pedrosa responding each time. 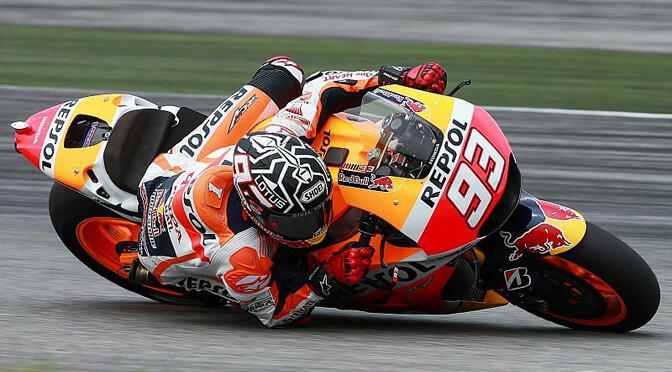 Marquez was able to maintain his advantage and win by almost one and a half seconds after Pedrosa made a mistake. Nonetheless Pedrosa was able to claim his seventh podium of the season, and mark Repsol Hondaâ€™s third 1-2 result. â€œIt looked like Assen but in the end everyone came in the pits because we all saw it was dry. I was worried about the back of the track initially and in the end my strategy was to copy Dani and (Valentino) Rossi, my main rivals for the championship. I followed them. The race was nice in the beginning because I overtook several riders and then I had a good battle with Dani. Iâ€™m really happy for this victory. Now we can relax a bit!â€ commented Marquez.